Saurabh Sogi, a computer science major in the University of Houston’s College of Natural Sciences and Mathematics, is part of a team that qualified for the finals of the NASA Space Robotics Challenge. For their efforts as finalists, they were awarded $15,000 from NASA, and are currently competing in the finals, with a total prize pool of $1 million. Twenty finalist teams were selected out of 92 that finished the preliminary round; 405 teams signed up for the challenge. Anyone is allowed to compete, with teams made up of students and professionals coming from universities, industry, and research labs from around the world. Working alongside Sogi are Shireen Bahadur, from the University of Texas at Dallas, and Vamsi Ghorakavi, from the University of Texas at Austin. As a team, they call themselves BIT PLEASE. 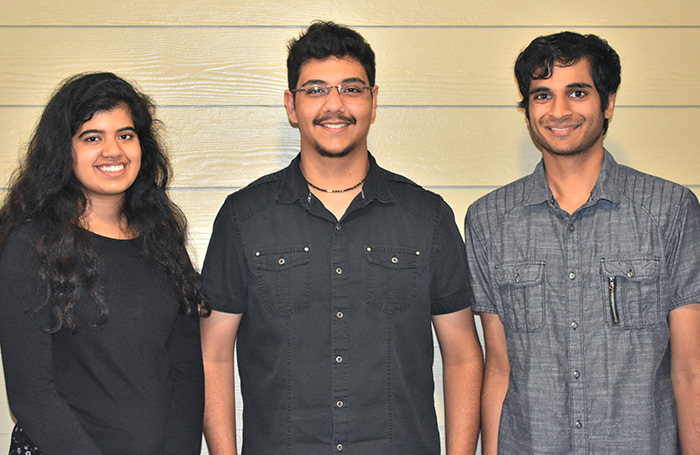 Shireen Bahadur, Vamsi Ghorakavi and Saurabh Sogi made it to the finals round of the NASA Space Robotics Challenge.Sogi, who just completed his freshman year at UH, became interested in computer science and robotics while in high school. Ghorakavi, who he went to Cy-Fair High School with, also shared a similar field of interest. When Sogi learned about the Space Robotics Challenge, he decided to put together a team. As luck would have it, Sogi’s childhood friend Bahadur, who he met while living in Boise, Idaho, had just moved to Dallas to study computer science in college. Just six hours before the registration deadline closed, Sogi called her, asking if she wanted to join the team. After a brief hesitation, mostly due to concerns about balancing the demands of this competition with her class schedule and other extracurriculars, Bahadur said yes. For the preliminary round, the team had to figure out how to program NASA’s Robonaut 5, nicknamed “Valkyrie,” to perform specific tasks. 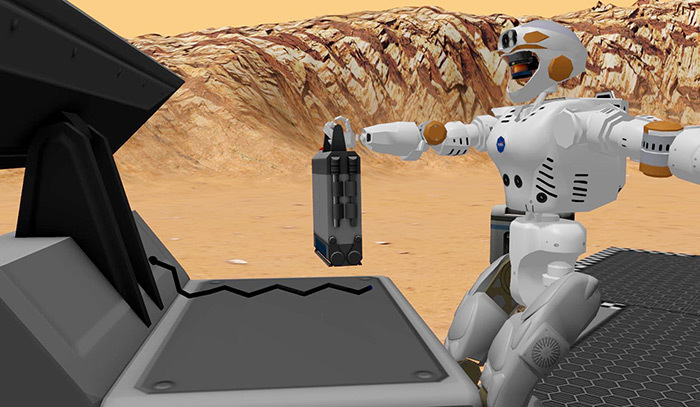 During the final rounds, teams will program the Valkyrie robot to align a communications dish, repair a solar array, and fix a habitat leak.Valkyrie, a humanoid robot designed to assist with NASA procedures, was created to accompany astronauts on long missions, such as a trip to Mars. On the way, Valkyrie would help the crew by performing tasks that are too complicated or dangerous for the astronauts. In the preliminary round, the first task was to identify a correct sequence of flashing lights while the second task was for Valkyrie to walk to a door, press a button, then walk through the door. These challenges were scored according to time and accuracy. Programming a robot to do these tasks requires a sophisticated level of computation that has to be done in real-time. The first task of identifying a series of flashing lights meant programming Valkyrie to analyze images in real-time. This meant cleaning up an image, segmenting it into identifiable regions, and then comparing sequential images to a baseline image. This process allows the robot to determine which light has flashed on at what time. For this to work, all of this has to be done quickly. For the second task, programming a robot to walk means taking into account the physics of walking, programming the robot to position its torso and limbs in a coordinated manner. With the help of Ghorakavi, Bahadur, who has a background in dance, was the team member who helped optimize the walking code to figure out the fastest way to get the robot to push the button and walk out the door. The final round, which will take place June 13-16, will simulate a dust storm on Mars. During the final round, teams will program Valkyrie to align a communications dish, repair a solar array, and fix a habitat leak. Until then, they are hard at work putting in the prep work to complete these tasks.